When Apple bought Emagic two years ago, the question on everyone's lips was 'What will they do with Logic?' Now they've unveiled perhaps the most radical overhaul the sequencer has ever seen, with improvements ranging from new instruments and effects to a networking system that could eliminate CPU restrictions completely. Because of Apple's policy of not announcing products or upgrades until they are very close to shipping, Logic Pro 7 will probably already be in the shops by the time you read this feature, written after a flying visit to Hamburg for a pre-launch preview followed by a couple of days' opportunity to play with the software for myself. A full review will follow next month when I've had a chance to use the program in anger, but in the meantime, I've learned enough to offer this detailed exclusive preview. Some elements may be subject to change at the last minute, but if all goes to plan, the release version will be on sale by the end of September or very early in October. Logic has retained backwards compatibility with Mac OS 9 for longer than most applications, but version 7 will be the first to support OS X only. With its distinctive new Apple-style packaging, Logic Pro 7 is without doubt the biggest overhaul Logic has ever seen. Emagic's office in Hamburg still operates under the Emagic name, but that name is no longer on the Logic box, and the fact that Logic Pro is now an Apple product has been made very clear. Apple's strategy is to slot Logic Pro into their existing range of high-end media applications such as Final Cut Pro, and to this end, they've tidied up certain visual aspects of the program using what can best be described as Apple's house style. 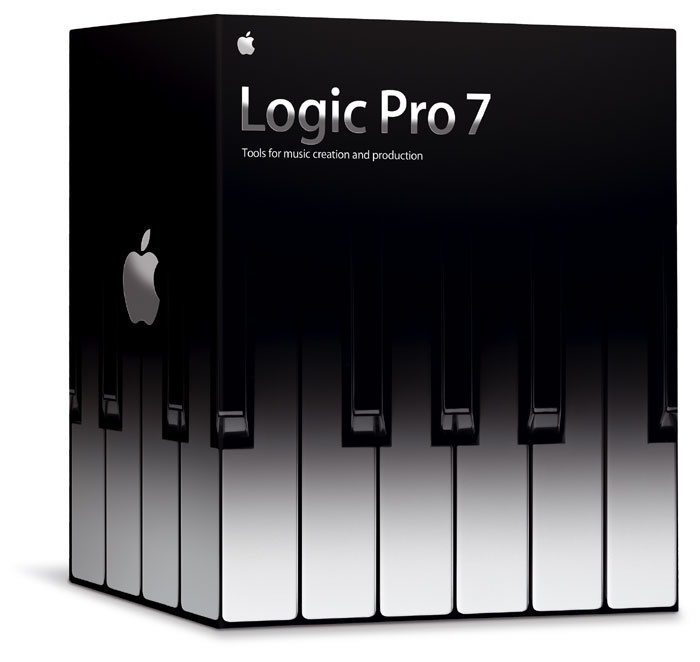 Any suggestions that Logic Pro is being dumbed down to make it more of a consumer product are firmly dispelled by the direction Logic 7 is taking, though not surprisingly, Apple have aimed for a greater degree of compatibility and file interchangeability with their other media software. Inevitably, there are new features, new plug-ins and improvements to existing features, but there are also some welcome surprises, not least being the inclusion of the Waveburner CD-writing application. In fact the leap from Pro 6 to Pro 7 is so significant that it's difficult to know where to start. Visually, the program is quite clearly still the Logic Pro we all know and love, yet it has benefited from a significant degree of 'Appleisation' most evident in the Arrange window, the menus and the preference panes, with the result that these items are much better organised and clearer to read. This facelift also extends to the score window, where the original bitmapped fonts have been replaced by scaleable, smoothed fonts for a more professional look when printed. Under the hood, the Apple Loops audio engine employed in Garage Band has been integrated into Logic Pro, offering a load of new features for working with loop-based music: for instance, the standard Logic region-looping facility is retained alongside the one used in Garage Band where loops are created by dragging from the end of an original audio region to the desired location. 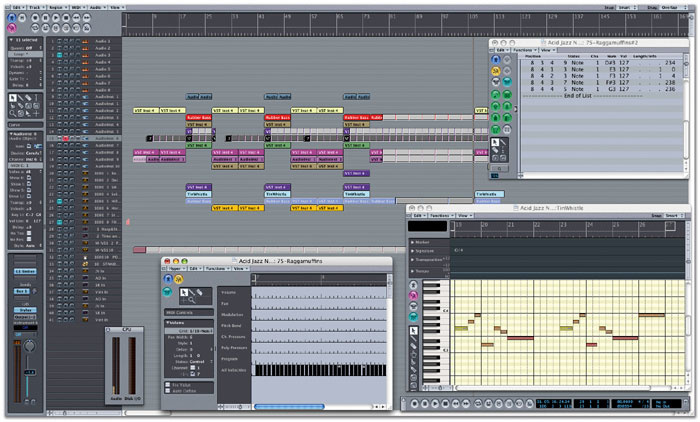 The Arrange, Matrix, Hyper Edit and Score Edit windows have also gained an extra section called Global Tracks where the user has graphical control over tempo, key and time signatures, markers, and more. It is also now where imported video can be shown on a timeline with the automatic detection and display of scene changes. Tempo can now be managed using an editable 'line' in very much the same way as other track automation functions. You'll also find a new Chord Track that maintains what Apple call a 'harmonic map' of the song's MIDI parts. This can be constructed manually or extracted from MIDI parts, and allows global harmonic changes to be made very easily. Any compatible Apple Loops will follow chord changes incorporated into the Chord Track. Where an arrangement contains conventional audio parts, these won't be altered when a tempo change or harmonic change is added, although it is apparently possible to convert standard audio recordings into Apple Loops, after which they can be manipulated freely in both pitch and tempo. A Transpose Track controls conventional 'root note' transposition and is linked with the Chord Track so that making changes in either one results in the correct change to the MIDI and Apple Loop data. The Signature Track displays both time and key signatures, and this is also linked to the processing of Apple Loops. To conserve screen space the Global Track, which is normally at the top of the Arrange window's working area, may be hidden when not required, but from what I've seen, its video thumbnail features in particular will be welcomed by anyone who does sound-to-picture work as it includes handy automatic options, such as the ability to create markers to denote scene changes and tempo tools to help match visual and musical hit points. Logic 's new-found compatibility with Garage Band goes much further than allowing the use of Apple Loops, as entire Garage Band songs can now be imported. Apparently many serious musicians have been using Garage Band as an ideas scratchpad for writing songs on the move and viewed the lack of compatibility as as a gaping hole in Apple's strategy. As well as providing a logical upgrade path for Garage Band users, Logic Pro now supports XML import and export, making it easier to move material between Logic and applications such as Final Cut Pro. 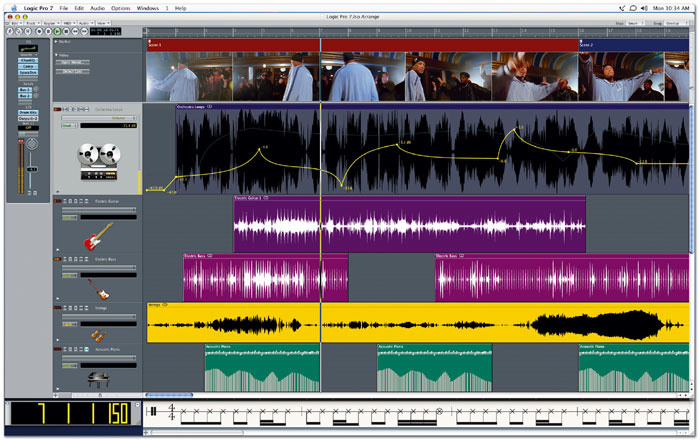 Quicktime movie soundtracks can also be imported or exported, and Logic Pro has also been upgraded to handle AAC Audio (Advanced Audio Coding) making it possible to provide multi-channel support with the benefits of a data compression system that is technically superior to MP3. AAC is already used by many Internet radio stations and digital broadcast facilities and is supported by iTunes, which in turn means songs can be transferred to an iPod in this format. New networking system enables additional computers to share the CPU load. New plug-ins including the Sculpture and Ultrabeat instruments and Guitar Amp Pro amp modeller. New Shuffle, multiple Snap and Crossfade audio edit modes. 34 software instruments including all the Garage Band collection. Over 70 plug-in effects and processors. Save and load of channel strip configurations. Up to 255 stereo audio tracks. Up to 128 software instrument tracks. Up to 64 busses and 64 aux channels. Up to 15 inserts and 8 aux sends per channel. Offline bouncing of single or multiple tracks. Can import Garage Band songs. Final Cut/XML, AAF, OMF and Open TTL file import and export. AAC and MP3 import and export. Perhaps the biggest single new feature in Logic Pro 7 is that it now provides a way to use additional computers to share the processing load. This really needs G5s to work effectively and operates over high-speed Ethernet using the TCP protocol, where the additional computers function as networked nodes. The documentation suggests that connection over Firewire will also be possible, although apparently this is not the best choice, as the Firewire bandwidth is lower than Gigabit Ethernet and has to be shared with any Firewire interfaces or hard drives that are also in use. 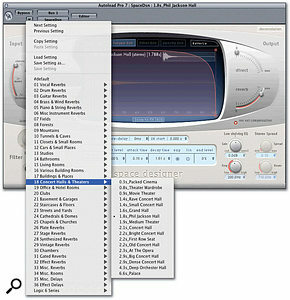 The main Logic windows, such as the Arrange page, are familiar from previous versions, but have benefited from Apple's graphical makeover. Where more than one node (additional computer) is connected, the network switcher used must be able to offer a bandwidth of at least one Gigabit, enabling it to handle up to 128 simultaneous stereo tracks to and from the node system. Logic Node, as the system is called, requires OS 10.3 or later, with the host machine being a G4 or later and the nodes ideally being G5s. The necessary node software comes with Logic Pro 7, no additional XS Keys are needed and Logic Pro only needs to be installed on the master machine. I asked about the latency implications of using a system like this and was told that there are certain latency penalties for real-time instrument tracks running on nodes, but you can switch tracks from the host processor to node processing at the touch of a Track Node button so this isn't really an obstacle. All you need to do is ensure that a software instrument is running on the host machine when you are recording its part and you'll have no more latency than normal. Once the part has been recorded, you can switch it to run on a node for future playback. According to Apple, the use of TCP means that as faster networking technologies become available, the increased bandwidth will support more simultaneous audio channels. I saw this running with a G4 laptop as the master machine and a G5 as the node and it worked seamlessly. Of course if you don't have extra computers, there's always the existing track Freeze button, and one recurring user request was for a way to make Frozen tracks permanent. This hasn't been implemented quite as expected, but a Total Track Bounce mode can be used to render all the audio and software instrument tracks to permanent audio files. There's also a new External Instruments I/O plug-in for feeding hardware instruments into the mix, although it's not yet possible to bounce these tracks like software instrument tracks. Several criticisms have, in the past, been levelled at the audio capabilities of Logic, not least the ease with which audio can be edited, the absence of sample-accurate audio editing in the Arrange page and the lack of plug-in delay compensation in audio paths other than the main tracks. Apple are aware of the need to provide comprehensive plug-in delay compensation but have chosen not to prioritise it for this release; nor have they addressed the sample-accuracy editing issue. The latter doesn't bother me too much, but I'm surprised that the plug-in delay compensation issue hasn't been resolved as it impacts on the way that plug-ins can be deployed in audio Objects other than tracks. However, they have weighed in with some long-overdue and very useful new Arrange window editing modes, specifically Shuffle, multiple Snap and Crossfade. Shuffle lets you seamless stack regions without gaps or overlaps in a similar way to Pro Tools, but goes one better by offering separate Shuffle Left and Right modes, while the Snap menu provides the option to snap regions to a user-definable time grid. Crossfade creates an automatic crossfade when two audio regions are overlapped by dragging one over the other. Several other workflow enhancements have been added, including the one that was right at the top of my list — you can now start a new song as a Project rather than simply being able to save it as a Project afterwards. All imported media can be automatically moved or copied into the newly created Project folder as the work progresses so you can be confident that everything the song needs is in the same place. The Project Manager has also been tidied up with a new, clean Apple look and speedier operation. Amongst other improvements, the Track Mixer now allows you to store and load channel strip settings, including multiple instrument and effects plug-ins. Another nice touch is the addition of Templates, which are conceptually similar having to multiple Autoload songs, each customised for different tasks. Here you can create different default setups for the different types of jobs you do and then call up the optimum one when you start a fresh project. Furthermore, you can now create the desired number of audio tracks, instrument tracks and so on from a setup dialogue box rather than having to manually change the Logic Environment and Arrange page. Where there aren't sufficient audio Objects already available in the Environment, appropriate new ones will be created automatically as you specify the number you need. From within the Track Mixer or the Channel Strip in the Arrange window, you can now load and save complete channel strip settings — this is another feature many users have been asking for, and means that you can now recall complex setups involving multiple plug-ins and instruments from a simple menu, with over 450 instrument and audio channel strip presets supplied. Multiple Objects may be selected and their routing edited simultaneously, which is another great time-saver, and each track now has its own Solo button. However, the niggles with the Auto Track Zoom function have not yet been addressed, though they are apparently on the list. My main gripe here is that when this function is active, the track zooms whether selected in the main 'working' part of the Arrange window or within the track header section at the left of the window. Zooming when you click in the track header is fine, but because zooming also occurs when you're in the main part of the Arrange page, tracks have a habit of jumping around when you're trying to edit them, and if the automation is visible, you end up grabbing the automation when you were trying to edit the object length or position. Giving the user the option to have this work only when clicking in the track header would make far more sense to me. A further welcome time-saver is that the Finder menu can now be accessed directly from within the Audio window so that you can browse audio files on various drives, while a new Audio Window Groups function has been introduced to allow you to organise audio files into logical groups for easier handling. Multiple undo has been extended to the Sample Edit window and new keyboard features accessible via the Caps Lock key have been introduced to allow note and velocity information to be input from a QWERTY keyboard — handy for songwriting on the train! While on the subject of convenience, Logic Pro is now easier to set up for use with external MIDI control devices, such as controller keyboards with MIDI controller knobs or faders. This has been achieved by adding an easy-to-use MIDI learn feature where you select the on-screen parameter you wish to control, then twiddle the physical control you wish to assign to it to make the connection. The Logic 6 limitation of 128 MIDI-controllable parameters per track has now been lifted, and the controller learning features will work with third-party plug-ins as well as Logic 's own instruments and effects. The new physical modelling Sculpture instrument. If the number of augmentations in the look, feel and general capability of Logic Pro seems generous, what's happened in the plug-in department is staggering. Logic Pro now ships with some 34 software instruments and over 70 effect/processor plug-ins, some of which are incredibly sophisticated. At Winter NAMM earlier this year, we got a sneak preview of Sculpture, a physical modelling synth that can emulate the vibrational modes of strings and pipes, then manipulate and morph them in a number of ways to provide both organic-sounding instruments and some incredible abstract creations that span all musical genres, from cutting-edge dance to ambient and pop. A central panel allows the user to move between different materials from which the modelled vibrating components are made, while the Exciters section determines how the sound is initiated — bowed, picked, struck, blown or whatever. Up to three Exciters can be combined along with other parameters that disturb the vibration in a variety of natural and unnatural ways. It has to be worth upgrading just to get your hands on Sculpture — but there's more! It might not make any noise of its own, but the Multimeter metering plug-in will nonetheless prove hugely valuable thanks to its sophisticated spectral analysis and phase tools. We were also given a glimpse of Ultrabeat at the Winter NAMM show; this synthetic drum-sound generator combines analogue-style synthesis, FM, sample playback and component modelling to offer the most amazing range of drum and percussion sounds. Each voice provides two oscillators, a noise generator and a ring modulator, and you can also use your own drum samples. Up to 24 different voices can be generated simultaneously, while Ultrabeat 's beatbox-style internal step sequencer can be triggered from within Logic Pro 's Arrange page using MIDI notes, to allow patterns to be changed during the course of a song. The level and gate times can be set for each sequencer step and there are also some handy randomise functions that can be used to add variety to the loops you create. There's also a 25th voice which spans the rest of the keyboard and is used for monosynth and bass sounds. Compared to these two heavyweights, EFM1 looks fairly small and simple, but in reality it is a powerful FM synth that is great for creating all the classic 'DX-like' bells, organs and electric piano sounds. It's also possible to deliberately overmodulate the oscillators to produce more aggressive effects. If this isn't enough, Logic Pro also comes with the full suite of Garage Band software instruments — if you think about it, it has to have these in order to be able to open and run existing Garage Band songs. The EXS24 sampler has also been updated to allow the drag-and-drop placement of samples in the Edit page — another favourite on the wish-list. Additionally, the previously optional Extreme Analogue and Extreme Digital sample libraries now come as part of the new bundle, along with many new samples and instruments, the total running to some 900 sampler instruments and 3.4GB of samples. Apple Loops are a special type of audio file used by Soundtrack and Garage Band as well as Logic 7. As well as the audio data, Apple Loops also contain metadata, enabling them to be pitch-shifted or time-stretched over a fairly wide range with the minimum of side-effects. The metadata also includes 'tag' information describing the loops' genre, instrumentation and so on, allowing you to search for loops that meet particular criteria. Some Apple Loops contain both the audio and MIDI versions of the file, so that the performance can be recreated using a software instrument rather than just the original audio. Now that Logic Pro supports Apple Loops, all Garage Band and Soundtrack loop packs can be used directly from within Logic, as can any of the third-party offerings in that format. Apple are actively encouraging third-party development of material in this format so the range seems certain to increase significantly in the future. Apple have recently announced two more titles to be added to their Garage Band Jam Pack — one aimed at the dance music composer and one offering a mix of general-purpose pop and rock material. The additions to the effects and processor plug-in armoury are no less dramatic. Guitar Amp Pro is a new take on the amp/speaker modelling familiar to guitar players everywhere and allows the user to combine amplifers, EQ sections and speakers from a range of different models. There are also reverb and tremolo effects based on convolution technology for the greatest degree of realism, and early listening experiences were very encouraging. It's also possible to use some or all of the components of Guitar Amp Pro for re-amping existing recordings or for processing synthesized sounds. Next up comes Ringshifter, which despite the name isn't a description of the after-effects of a particularly piquant chicken Jalfrezi! This effects plug-in combines ring modulation with frequency-shifting and is generally useful for turning tame musical sounds into clangorous mayhem. You can also use it in a more genteel way to create phasing or chorus effects. Beside it in the 'take a perfectly good sound and bugger it up good and proper' category is the new Vocal Transformer which can create robot voices, formant-shifted cartoon mice and so forth. Go on, you know you want to! 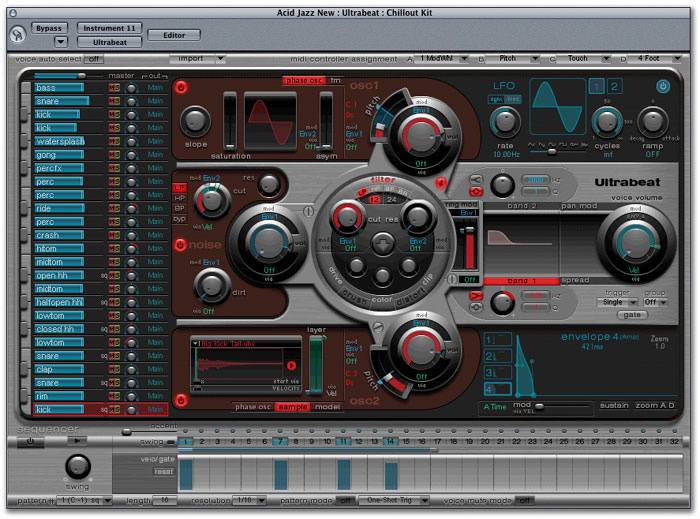 Ultrabeat is a powerful percussion synthesizer with its own pattern sequencer. As if by way of apology for what the above-mentioned plug-ins are capable of doing to your sound, the next very welcome inclusion is Pitch Correction. Like most of the other intonation-correction plug-ins doing the rounds, this can nudge imperfect vocal or instrumental recordings on to the correct pitch. A piano keyboard display allows you to set up the notes in the scale you wish to use as your correction template and the correction rate is variable, so you use medium to slow correction for a natural-sounding result or fast correction for that cliched 'not unlike Cher' vocal effect. The information I have on this makes no mention of a real-time MIDI-controlled correction mode, but as with all Logic plug-ins, the parameters can be automated using Logic 's track automation. Logic 's channel EQ now has a Linear Phase counterpart that offers the same functionality — you can even copy EQ settings between the conventional and Linear Phase versions — but without introducing the phase shifts normally associated with most equaliser designs. Real analogue equalisers always introduce phase shifts, and this is part of their sonic charm, but on some material the surgical clarity of a zero-phase EQ can be a useful alternative. Inevitably, this type of filter has a fairly large inherent processing delay so this EQ is best used after recording rather than while tracking. A nice addition, but not as dramatic as Match EQ. Match EQ is Logic 's take on the now-familiar fingerprint equaliser, which allows the audio spectrum of one signal to be imposed upon another. In essence, the filter 'learns' a section of reference audio which is then copied over to the plug-in in the target audio track. 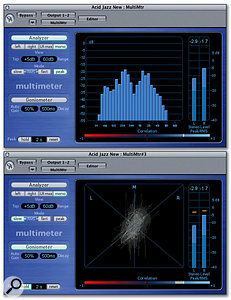 Match EQ then computes a multi-band filter to match the audio spectrum of the target piece to that of the reference. This can be used to match the characteristics of recordings made in different rooms or with different mics, and it can also be useful in processing whole mixes to make them sound tonally similar to a reference mix. A number of simple tools are available to vary the depth of processing imparted and in the examples I heard, the results were very impressive. As with any fingerprint EQ of this type, when you're matching the tonality of mixes, the target and reference pieces need to be of a similar musical style and they should ideally have similar instrumentation, otherwise the end result can be rather unpredictable. Good fingerprint EQ plug-ins can be quite costly, so having one thrown in for the price of an upgrade is amazing value. The next plug-in is neither effect nor processor but rather a very sophisticated meter. 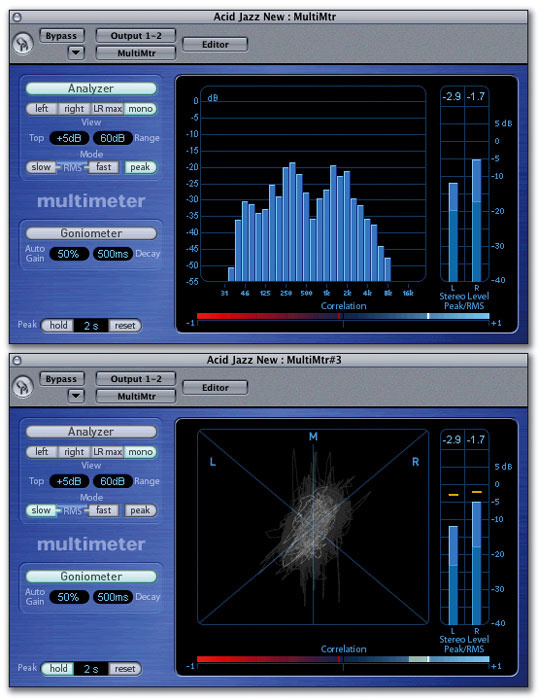 Multimeter incorporates a third-octave spectrum analyser, a precision level meter with a log scale, a stereo correlation meter to show up phase problems and, my favourite, a goniometer to show the signal's stereo phase and balance on a single display. Hardware meters of this kind can cost as much as Logic Pro plus the Mac you run it on, so getting one bundled is a real bonus. There are more plug-ins that I don't have space to cover here, but one long overdue feature that has been added is the ability to link plug-in windows to the Arrange window, so that when you change tracks, you see the plug-in associated with that track. 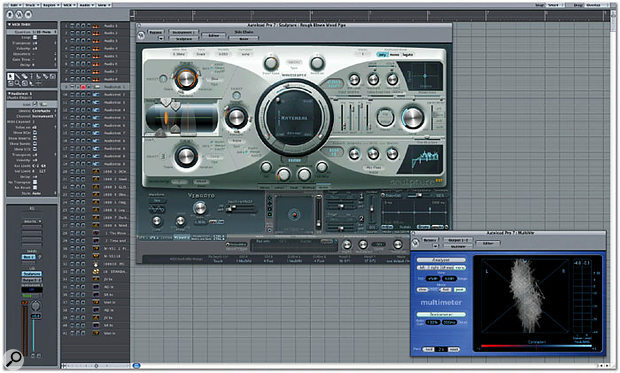 Where multiple plug-ins are being used in a track, the topmost one is shown. A final welcome surprise is that Emagic's Waveburner CD-writing application has now been incorporated into Logic, although I didn't get to see it in action. Having had just a few hours so far to explore Logic Pro 7 for myself, I have discovered some interesting little tweaks and tucks such as the replacement of telescope zoom buttons by sliders that quickly scale the zoom value to whatever you need. However, the track icon list hasn't had any new additions and it is now accessed via an interminable list rather than a nice clear panel, so that's a step back in my view. There's also a reassuring AU checking program that examines all your non-Emagic AU plug-ins for compatibility so as to avoid stability problems. Normally this only happens when you install Logic Pro or add new plug-ins, so it allows Logic Pro to open much more quickly under normal circumstances. You can still use plug-ins that it rejects if you add them to the list yourself, but they appear in a category called 'Incompatible'. Unfortunately, all my Waves, Spectrasonics, Native Instruments and Powercore plug-ins crashed the AU checker or failed some aspect of the test, but when I ticked them anyway, they worked fine. A test info window indicates that the failure may be due to not opening in a specific period of time, though why this should cause problems I'm not sure. My Korg Legacy Collection, which is the latest version, was also flagged as failed, but this too worked fine. Ironically, one of Apple's own AU plug-ins was failed too! This is, however, a great feature and when it has been improved to prevent it crashing out when it sees something it doesn't want to deal with, it will be even better. One very welcome surprise is that Space Designer has suddenly acquired a huge library of reverb presets that completely dwarfs the original and that includes all the interesting rooms and concert halls that the original lacked. Logic Pro and its songs also have a new icon so there's no chance of confusing Logic songs with Quicktime files as there was in the past. Yet another nice feature is the way the channel strip is displayed on the Arrange page. This part of the screen has been redesigned to allow the whole channel strip to be viewed on smaller monitors and if it still won't fit or if you resize the Arrange window height, the top of the channel strip 'slides under' the boxes above it so that you can still leave the all-important fader poking out. Inevitably, any major software update is a balancing act between adding new features to wow the marketplace and fixing problems or shortcomings to satisfy the existing user. Logic Pro 7 has its share of both, though there are some important issues that I feel are fundamental to a professional audio application that still haven't been addressed, so I can only hope these are planned for the next revision. Most serious is the lack of proper plug-in delay compensation for all audio paths, while I still don't feel that Logic has particularly good limiter or denoising plug-ins, and it's a shame that Apple haven't followed MOTU's lead in supporting multiple audio interfaces simultaneously under Core Audio. However, most of what I've seen is very good news for the user. The Space Designer convolution reverb now includes an extensive new library of presets. In my view, the excellent plug-ins that came with Logic Pro version 6 made it the best value of all the MIDI + Audio packages out there but in the plug-in department, version 7 is better than Christmas! In fact there are so many great plug-ins now included as standard that some of the third-party plug-in designers are going to have to work very hard in order to tempt the Logic Pro user to spend more money. (Speaking of pricing, no UK prices had been set when we went to press, but Apple had confirmed that US pricing would be unchanged.) The ability to eliminate restrictions on processing power without the use of dedicated DSP hardware, by networking one or more extra G5s, will also be a killer feature for power users who need to run lots of instruments — especially as you won't need to shell out for extra copies of Logic to run on the other machines. The streamlining and general makeover is well thought out, and finally I get my wish of being able to start a song as a Project. By way of ease of use, the improved setup assistant plus the ability to store numerous different templates makes a lot of sense, as does the integration with Garage Band that allows Logic to import and play back Garage Band songs with all their original instruments. And, of course, there's the usual welter of more minor improvements — one that stands out to me is the provision of a discrete level control for the Centre channel in surround mixes. Logic Express users also benefit, with more plug-ins (37 in total) including Guitar Amp, Channel EQ and Platinumverb. The software instrument total in Logic Express rises to a generous 18, you get the same 1000 Apple Loops as are bundled with Logic Pro 7, and again Garage Band songs can be imported. Apple have a reputation for launching software that is stable from the first incarnation: if a feature can't be made reliable, then it gets left out until it is fixed. I'm told this philosophy is also being applied to Logic Pro, which may account for why some of the popular items on the wish-list aren't yet implemented. However, Apple have been reviewing all of the suggestions you sent in via Logic Notes and they have conveyed their thanks. They tell me that around half of the points that regularly arise have already been addressed in Logic Pro 7 and inevitably more will follow.